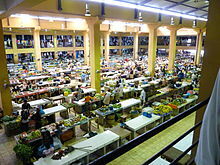 Santomean cuisine comprises the cuisine, dishes and foods of São Tomé and Príncipe, a Portuguese-speaking island nation in the Gulf of Guinea, off the western equatorial coast of Central Africa. The country consists of two archipelagos around the two main islands: São Tomé and Príncipe, located about 140 kilometres (87 mi) apart and about 250 and 225 kilometres (155 and 140 mi), respectively, off the northwestern coast of Gabon. Canjica is a porridge that is prepared with canjica maize kernels, egg, sugar, cinnamon and water.